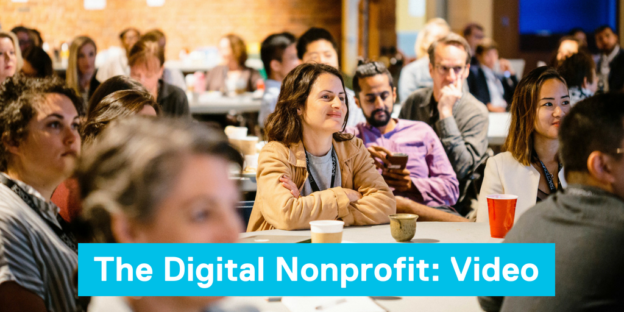 We created The Digital Nonprofit conference because after 10 years of meetups our members asked us for an event that was more “boss friendly”. A place where we could talk about digital strategy and transformation, not just practical hands-on technology implementation. But we didn’t anticipate the hunger for a community-driven #Tech4Good conference. Even as we grew from 80 attendees to 225 we’ve continued to sell out every year. So thank you for your support! It means so much because as volunteers your encouragement is what motivates us to keep going! The audio’s a bit iffy, but we were able to record every session. Conferences don’t happen without a crew. We are grateful to our volunteers for running the show. We are in debt to the presenters who contributed their expertise. And we can’t thank the sponsors who underwrote the event enough, since they enabled us to create an accessible event for you, our #Tech4Good community. Our sponsors are investing in our community because they share our conviction that nonprofits need the power of technology to do more good. Give them your attention and $$! This entry was posted in Event report, The Digital Nonprofit 2018 and tagged DNP2018 on June 14, 2018 by admin.